When I was pregnant, I ate pounds upon pounds of kimchi. This dish was my way of being able to shovel even more of it down my throat. Now it’s a great go-to dish when I’m craving something spicy that’s super easy to make (20 minutes tops). What’s even better is that this recipe makes a good 4 bowls of food; enough to get my husband and I through two meals. Be forewarned, if you get your kimchi from the Whole Foods kimchi bar on 3rd, do not get an entire quart of the super spicy kimchi (get half super spicy and half regular if you want it super spicy, or all regular if you want regular spiciness). I love spice, but I’ve made this dish with the insanely spicy kimchi and it was difficult to get down. Plus, it made the air so intense that we had to keep the little one upstairs. **MAKE IT VEGAN: Substitute the chicken for tofu. First things first, put that rice up whenever you get a chance during the day so it is ready to go when you want to make this dish. Otherwise, grab some cooked rice from a Chinese place around the corner on your way home. Chop up the kimchi and put into a bowl. Heat vegetable oil in a large pot over medium high heat. Add chopped kimchi, stir with a wooden spoon and cook for one minute. Add cooked rice (cold or hot, makes no difference) and stir until thoroughly mixed. 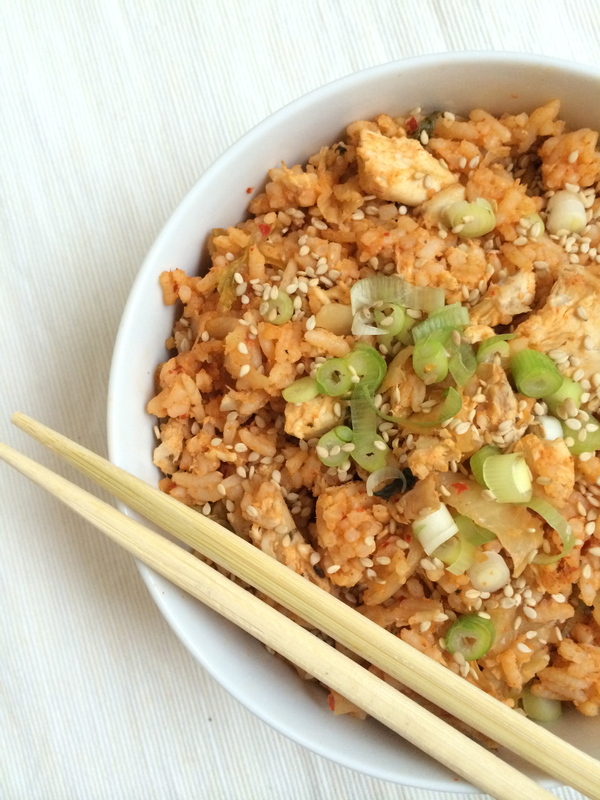 In the same bowl you placed the chopped kimchi, add ¼ cup water, 3 tbsp gochujang, and ½ cup kimchi juice. Stir until well mixed. Add to pot and stir to incorporate. While this is cooking (7 minutes total time), pull that roasted chicken apart and cut into bite sized pieces. Add to the pot around after 3 to 4 minutes of cooking. Don’t forget to stir the dish as much as you can with a wooden spoon–making sure to scrape that bottom of the pot–while it cooks for those 7 minutes. You may want to stop in the midst of chopping up that chicken to give it a good stir. Remove from heat. Stir in the sesame oil. Spoon into bowls and top with chopped green onions and sesame seeds.